Women in music face a steep climb up the charts and the ladder. Music’s biggest names will convene at the Staples Center in Los Angeles this Sunday for the 61st Grammy Awards. But in recent years, the show’s spotlight has shifted from the music and instead toward issues surrounding gender and race represented within the Recording Academy, and in the recording industry as a whole. 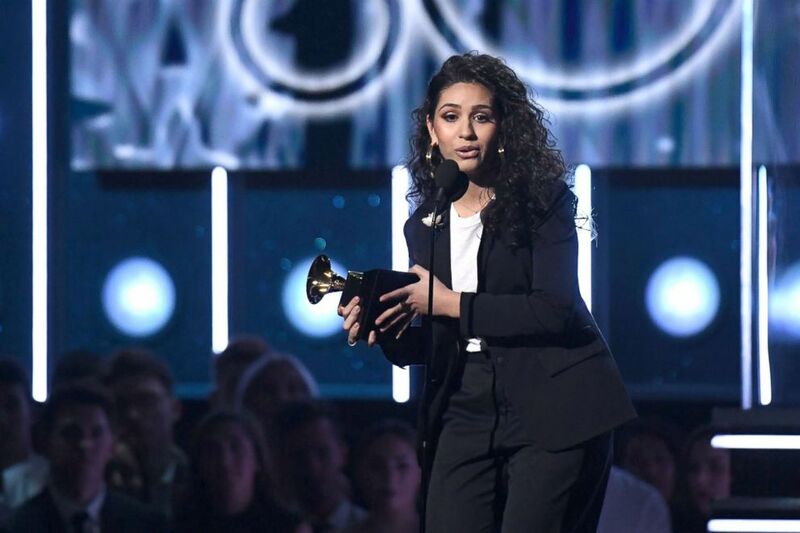 The issue of gender took center stage at last year’s Grammys when Alessia Cara was the only female to take home a solo award during the televised portion of the night. After the show, Recording Academy President Neil Portnow was asked about the lack of female winners during the evening’s telecast. He responded by telling reporters women wanting to work in the industry needed to “step up”. The comment resulted in fierce backlash from women in the industry and calls for his resignation, along with motivating the Recording Academy to take a multifaceted approach when analyzing how to address the ongoing issues of diversity and gender disparity. (Timothy A. Clary/AFP/Getty Images) Alessia Cara receives the Best New Artist Grammy during the 60th Annual Grammy Awards show, Jan. 28, 2018, in New York. The Recording Academy’s Task Force on Diversity & Inclusion, an independent 19-member group, has since been introduced. Tina Tchen, chief of staff to former First Lady Michelle Obama, was asked by Portnow to be the chair. Shortly after its creation, the task force recommended some of the 900 new voting members asked to join the Recording Academy in an effort to create a more diversified voting pool. According to the Grammys, “Invitations were sent to vocalists, songwriters, producers, instrumentalists and engineers from a range of music genres, ethnicities, age and gender groups.” Of those invited, the New York Times reports that 22 percent accepted in time to vote for this year’s ceremony. Joining Tchen on the task force is Grammy-nominated country artist Cam. For the outspoken “Burning House” singer-songwriter, the opportunity to make an impact and address systemic barriers facing women and underrepresented voices in the industry led to her involvement. (Valerie Macon/AFP/Getty Images) Cam arrives for the 2019 MusiCares Person Of The Year gala in Los Angeles, Feb. 8, 2019. In order to understand the issues at hand, the task force relied in part on quantitative data published by the Annenberg Inclusion Initiative. This initiative was founded and directed by University of Southern California professor Dr. Stacy L. Smith, another member of the task force. The data, which Tchen said was used and referenced by the group, looked at the gender and race/ethnicity of artists, songwriters, and producers across 700 popular songs from 2012-2018. The songs analyzed by the study came from the Hot 100 year-end Billboard charts for each of the seven years. “It just was overwhelming to see those kinds of numbers and see that tiny sliver in a pie chart and say, ‘That's my life and that's my livelihood. And those are all the people I employ.’ We are all living in that tiny sliver that's barely getting by. And that is really scary,” Cam said while sharing her thoughts as an artist. Beyond analyzing numerical data, Tchen led listening sessions in four major cities. The sessions were designed for Recording Academy members to share their own experiences working in the industry so the task force learn directly from them. Now the task force is focused on slowly rolling out solutions. Just last week, it announced its inaugural industry-wide initiative to expand opportunities for female producers and engineers, prompted in part by the USC Annenberg Inclusion Initiative study. It found that only 2 percent of music producers, and 3 percent of sound mixing and mastering engineers across popular music, were women. More than 200 artists, producers and labels signed on, including Ariana Grande, Lady Gaga and John Legend. In a week, Tchen said the number of industry members committed to the initiative has already grown to over 400. (Mario Anzuon/Reuters, FILE) Ariana Grande performs at Banc of California Stadium in Los Angeles, June 2, 2018. For Cam, the hope is that the information and statistics coming out won’t intimidate but rather will generate an awareness regarding the issues at hand and how those in power can help effectively address them. Tchen said this is just the first step in working to create a culture change within the industry, but she has high hopes for what the industry will look like down the road.